This awesome hardback copy of Batman: Cover to Cover features 239 pages of some of the greatest covers of the Dark Knight. From 1939 to 2005, it features over 250 different Batman covers from the Golden Age all the way to today. 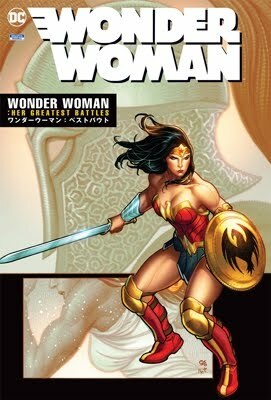 It is a first printing, comes complete with its dust jacket, and, best of all, is signed by hand by 24 of the artists whose work appears within the book. 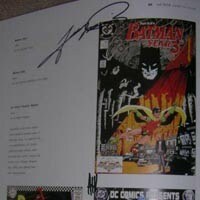 In order of their appearance below, the book is signed by hand by Jim Lee, Matt Wagner, Scott Hampton, Dan Brereton, Mike Mignola, Lee Bermejo, Bernie Wrightson, Tim Sale, Brian Bolland, Karl Story, Scott McDaniel, Joe Quesada, Carmine Infantino, Brian Stelfreeze, George Perez, Adam Hughes, Cully Hamner, Jerry Robinson, Jim Mooney, Geoff Johns, Neal Adams, Tom Yeates, Paul Pope, Bill Sienkiewicz, Mark Waid, Ed McGuinness, and J.G. Jones.